The EFX® 865 with Converging CrossRamp® combines reliability with a natural converging stride path to give you the perfect elliptical for your facility. Carrying on the tradition of Precor reliability and service, the EFX is easy to clean and maintain with a covered ramp and rear drive housing, and the Active Status Light – all to improve your ownership experience. For exercisers, the EFX 865 combines the benefits of our patented CrossRamp® technology and moving handlebars for a total-body workout. The adjustable CrossRamp® technology offers ramp inclines from 10 to 35 degrees to target different muscle groups for more workout variety. And, our unique converging stride path allows the exerciser’s footpath to converge naturally – just like walking or running. The EFX 865 is available in two frame colors: Silver and Black. CrossRamp® Technology Provides 20 different settings (10-35 degree ramp incline) for users to target different muscle groups. Ideal for all age and fitness levels. Biomechanics Biomechanics validated by Western Washington University for users of all ages, fitness levels and sizes, from the 5% size female to the 95% size male user. Bearings Dual, in-line polyurethane wheels with over-sized axles and premium sealed bearings provide a perfectly balanced load, gliding on stamped, stainless steel tracks for an incredibly smooth feel. Foot Pedals Oversized, polypropylene foot pedals fit your largest user and are easy to clean. Water Bottle and Accessories Holder Thoughtful,secure storage with a logical, clean place for your water bottle, cell phone, and other accessories. Covers Long lasting appearance with covered ramp, enclosed rear covers, and covered frame and pivot joints. Covered ramp to prevent dirt and debris build-up. Easy to clean without removing the ramp cover or pedals. Rear access cover can be removed and replaced in less than 2 minutes by removing only two screws. Convenient access to check and adjust drive belt tension. Front covers can be removed in less than 2 minutes, providing quick access to lift assembly. 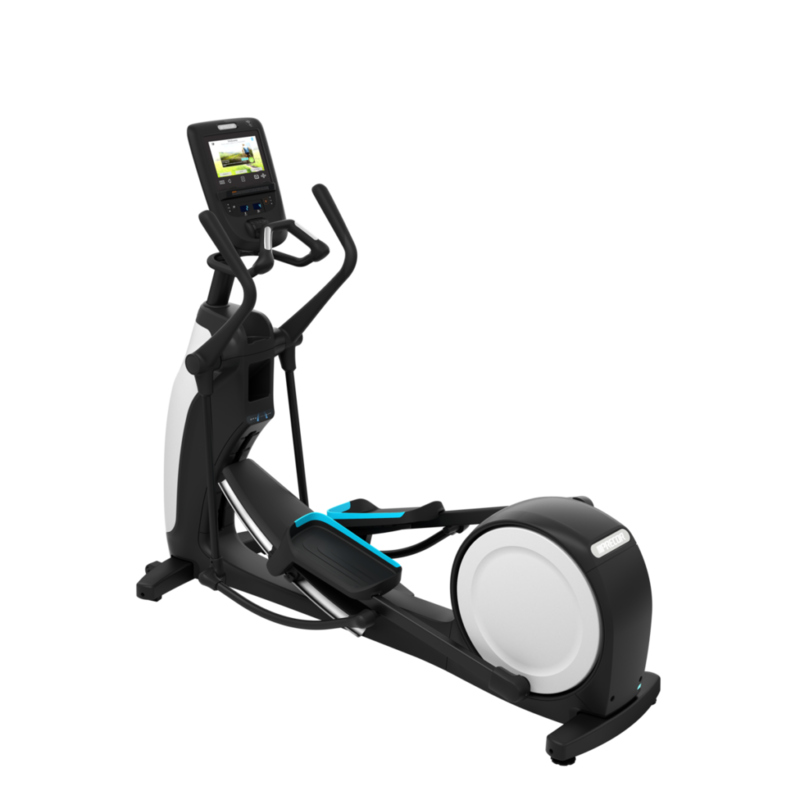 Resistance System Durable, 3-phase hybrid generator / eddy current system with new, faster controller provides 20 levels to tailor workouts with consistent, smooth resistance. The 20 resistance levels range from 18 watts (level 1 at 40 SPM) to 720 watts (level 20 at 200 SPM).